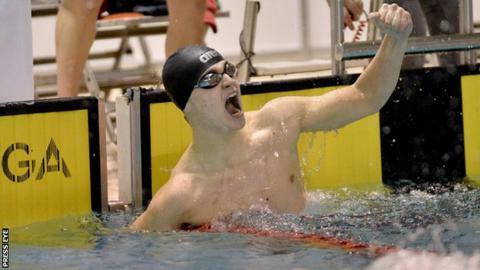 Larne swimmer Conor Ferguson has clinched his third medal at the Commonwealth Youth Games after another day of Northern Ireland success. Ferguson's 50 metres backstroke silver added to his earlier gold medal triumph in the 100m backstroke plus his bronze in the mixed 4x50m medley relay. The 15-year-old was joined by James Brown, Emma Reid and Danielle Hill in the successful relay squad. Northern Ireland's boxers have also guaranteed five more medals in Samoa. Stephen McKenna saw off England's Kieran MacDonald at 49kg with James McGivern, Aidan Walsh, Tiernan Bradley and Brett McGinty also all powering into the semi-finals in their divisions to ensure that all five Northern Ireland boxers will pick up at least a bronze. Bowler Stephen Kirkwood secured a singles bronze after defeating Malaysia's Daeng Dhadyry Dahasry 21-15 but Chloe Watson missed out on a semi-final spot in the women's event despite a battling 21-20 win over Scotland's Carla Banks. In other performances, squash mixed doubles hopefuls Ellie McVeigh and Stephen Hearst were edged out 2-1 in their contest against a Pakistani pairing and they will need to beat their Indian opponents on Wednesday to keep alive their hopes. Track and field athlete Lydia Mills, a sister of former 400m star Joanna Mills, placed sixth in the long jump final with a best leap of 5.65m.